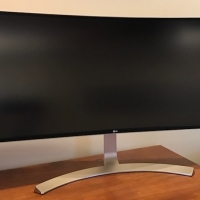 We've already looked at LG's UltraFine 5K and 27UD88 displays as companions for Apple's latest notebooks, and today we're taking a look at another USB-C display option that brings something quite different: LG's 38UC99 curved "UltraWide" display. 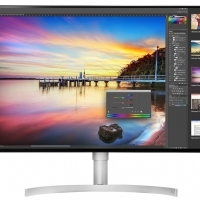 This is a desk-filling display in the truest sense of the term: 37.5 inches on the diagonal with a 21:9 aspect ratio and a native resolution of 3840x1600. 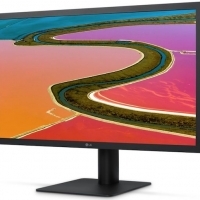 It has fewer pixels than a true 4K or Ultra HD display, but its sheer size makes up for it in some unique ways. 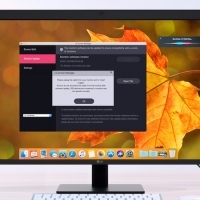 While the UltraFine 5K and 27UD88 displays work best at Retina or scaled resolutions, the 38UC99 uses a full 3840x1600 desktop that leaves everything on screen at just the right size to be useful. No, it's not a Retina display in this mode, but until we have 8K displays this will have to do. Even without Retina resolution, this display is impressive. The sheer size of it gives you so much flexibility in terms of your workspace. I can easily have three large windows open side-by-side with room to spare. UltraFine 5K, 38UC99, 2016 MacBook Pro (left to right) I've been testing this in a three-display setup with the new 15-inch MacBook Pro, an UltraFine 5K, and the 38UC99. It's a ridiculous amount of desktop space that I can barely fit on my desk, and the MacBook Pro with entry-level graphics runs all of it without breaking a sweat. 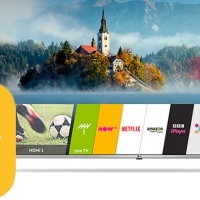 Following in the footsteps of Samsung and Vizio, LG today at CES 2019 announced that AirPlay 2 and HomeKit support is coming to its 2019 smart TVs. AirPlay 2 support will allow users to stream videos, music, photos, and more directly from an iPhone, iPad, and Mac to new LG smart TVs, complete with lock screen controls. HomeKit support will enable users to easily control the TVs using the Home app on iPhone, iPad, and Mac or Siri voice commands. 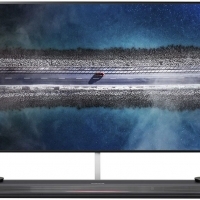 LG's press release:Users can use their own voice to get things done with Amazon Alexa, a new addition to LG's AI TV lineup in 2019, and the support of Apple AirPlay 2 and HomeKit. 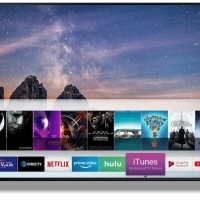 With AirPlay 2, users can easily play videos directly from their Apple devices, iTunes and other video apps, music or photos to their LG SIGNATURE OLED TV R. With Apple HomeKit support, customers will be able to control their LG TV using the Home app or by asking Siri.Apple recently updated its website with information about how AirPlay 2 and HomeKit will be implemented on smart TVs from "leading TV manufacturers." 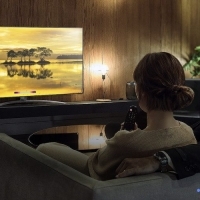 Samsung smart TVs are also getting a dedicated iTunes movies and TV shows app. Apple has contracted LG Display to begin production of OLED panels for iPhones. According to ETNews, the display panels will be produced at LG's E6 production line in Paju, with shipping to begin next month. LG will supply approximately 400,000 OLED panels to Apple before the end of the year, with the cost of each unit expected to be around $90. 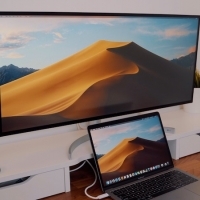 In September it was reported that LG's sixth-generation flexible OLED display panels passed a series of Apple's quality tests, which led to the preparation phase for mass production. 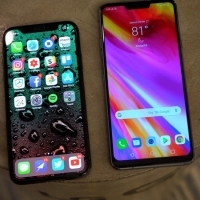 In April, a report claimed that Samsung would likely remain Apple's exclusive supplier of OLED display panels for its latest phones, after LG fell behind schedule due to mass production challenges. However it looks like LG has cemented its position as Apple's secondary supplier of OLED panels. Korean newspaper Newspin reported about a potential deal signed between Apple and LG back in July. 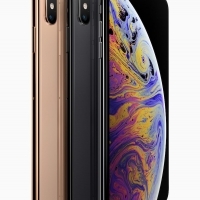 Apple in September launched the iPhone XS and iPhone XS Max with 5.8-inch and 6.5-inch OLED displays, respectively. 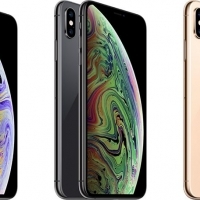 Last month it launched the more affordable iPhone XR, but that phone has a 6.1-inch LCD "Liquid Retina" display. Apple can potentially negotiate lower prices for OLED panels as Samsung and LG compete for its business, which should in turn lower its production costs of OLED-equipped iPhones. 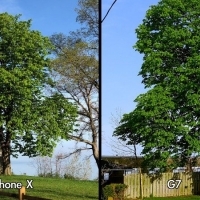 LG has denied copying the iPhone X's notched design with its latest G7 ThinQ smartphone, unveiled on Wednesday, according to The Korea Herald. 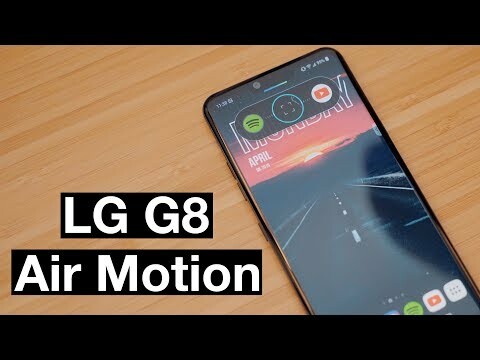 "We planned the notch design before Apple," said Hwang Jeong-hwan, chief of LG's mobile division, in an interview. "The display design may look similar to that of other smartphones, but boasts differentiated features." LG is one of several Android smartphone makers that have unveiled iPhone X lookalikes in the months following the debut of Apple's flagship handset, alongside the likes of Asus, Huawei, and others. 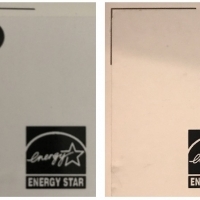 One notable holdout is Samsung, with its latest Galaxy S9 devices retaining uniform top and bottom bezels. Google introduced support for "the latest edge-to-edge screens" with a "display cutout for camera and speaker" in Android P, the next major version of its mobile operating system that will be seeded to devices like the G7 ThinQ. 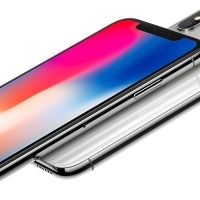 Apple has previously said the iPhone X reflects the next decade of smartphones, suggesting the controversial notch will remain for the foreseeable future. However, a questionable report from Korean website ET News recently suggested that Apple may remove the notch from iPhones starting with 2019 models. 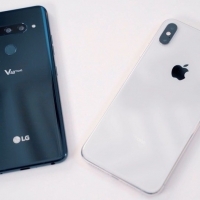 LG Display is widely considered to be ramping up its OLED display production capabilities in hopes of securing orders for Apple's next-generation iPhone lineup, expected to be released later this year, but mass production challenges have caused the company to fall behind schedule, according to The Wall Street Journal. 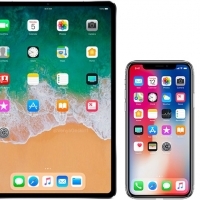 The report, citing people familiar with the matter, claims that Apple recently subjected LG to a third round of prototype production for the OLED displays, described as an extra step that most suppliers don't go through for many components. As a result, opinions within Apple are divided on whether LG Display will complement Samsung as a second source of OLED displays for the upcoming iPhones, according to the report. However, analysts at investment firm Susquehanna estimate that LG will supply as much as 20 percent of OLED displays for the 2018 lineup. 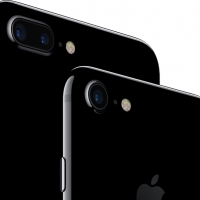 By securing orders from both Samsung and LG for OLED displays, Apple could benefit from more competitive prices and increased supply. Samsung is also one of Apple's largest rivals, so it's easy to see why Apple is aiming for diversification. 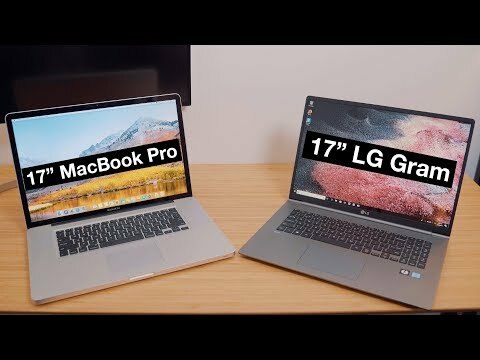 Should LG not be in a position to supply Apple with OLED displays for the next iPhones, it's unlikely that customers will notice much of an impact. If anything, availability of Apple's second-generation iPhone X and rumored iPhone X Plus could be slightly tighter, but supplies are typically limited at launch regardless.